Did you know that there was a mini-brain in your spine? Salk Institute scientists discover spinal “mini-brain”. Walking across an icy parking lot in winter–and remaining upright–takes intense concentration. But a new discovery suggests that much of the balancing act that our bodies perform when faced with such a task happens unconsciously, thanks to a cluster of neurons in our spinal cord that function as a “mini-brain” to integrate sensory information and make the necessary adjustments to our muscles so that we don’t slip and fall. 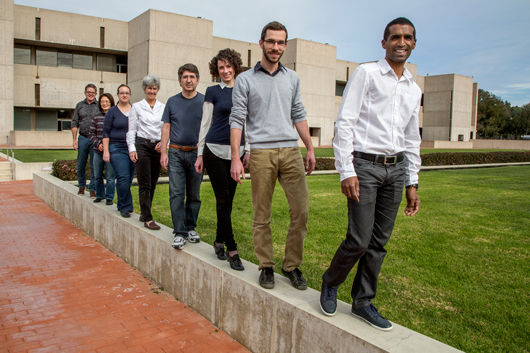 In a paper published January 29, 2015 in the journal Cell, Salk Institute scientists map the neural circuitry of the spinal cord that processes the sense of light touch. This circuit allows the body to reflexively make small adjustments to foot position and balance using light touch sensors in the feet. The study, conducted in mice, provides the first detailed blueprint for a spinal circuit that serves as control center for integrating motor commands from the brain with sensory information from the limbs. A better understanding of these circuits should eventually aid in developing therapies for spinal cord injury and diseases that affect motor skills and balance, as well as the means to prevent falls for the elderly. Salk Institute researchers mapped neural circuits in the spinal cord that process light touch signals from the feet, a critical function for fine motor tasks, such as walking on ice. This image shows this neural circuitry in a mouse spinal cord. The red cells are RORα neurons, which merge signals coming from neural fibers coming from the brain and limbs (both colored blue). “When we stand and walk, touch sensors on the soles of our feet detect subtle changes in pressure and movement. These sensors send signals to our spinal cord and then to the brain,” says Martyn Goulding, a Salk professor and senior author on the paper. While the brain’s role in cerebral achievements such as philosophy, mathematics and art often take center stage, much of what the nervous system does is to use information gathered from our environment to guide our movements. Walking across that icy parking lot, for instance, engages a number of our senses to prevent us from falling. Our eyes tell us whether we’re on shiny black ice or damp asphalt. Balance sensors in our inner ear keep our heads level with the ground. And sensors in our muscles and joints track the changing positions of our arms and legs. Every millisecond, multiple streams of information, including signals from the light touch transmission pathway that Goulding’s team has identified, flow into the brain. One way the brain handles this data is by preprocessing it in sensory way stations such as the eye or spinal cord. The eye, for instance, has a layer of neurons and light sensors at its back that performs visual calculations–a process known as “encoding”–before the information goes on to the visual centers in the brain. In the case of touch, scientists have long thought that the neurological choreography of movement relies on data-crunching circuits in the spinal cord. But until now, it has been exceedingly difficult to precisely identify the types of neurons involved and chart how they are wired together. In their study, the Salk scientists demystified this fine-tuned, sensory-motor control system. Using cutting-edge imaging techniques that rely on a reengineered rabies virus, they traced nerve fibers that carry signals from the touch sensors in the feet to their connections in the spinal cord. They found that these sensory fibers connect in the spinal cord with a group of neurons known as RORα neurons, named for a specific type of molecular receptor found in the nucleus of these cells. The RORα neurons in turn are connected by neurons in the motor region of brain, suggesting they might serve as a critical link between the brain and the feet. When Goulding’s team disabled the RORα neurons in the spinal cord using genetically modified mice developed at Salk, they found that these mice were substantially less sensitive to movement across the surface of the skin or to a sticky piece of tape placed on their feet. Despite this, the animals were still able to walk and stand normally on flat ground. However, when the researchers had the animals walk across a narrow, elevated beam, a task that required more effort and skill, the animals struggled, performing more clumsily than animals with intact RORα neurons. The scientists attribute this to the animals’ reduced ability to sense skin deformation when a foot was slipping off the edge and respond accordingly with small adjustments in foot position and balance–motor skills similar to those necessary for balancing on ice or other slippery surfaces. Another important characteristic of the RORα neurons is that they don’t just receive signals from the brain and the light touch sensors, but also directly connect with neurons in the ventral spinal cord that control movement. Thus, they are at the center of a “mini-brain” in the spinal cord that integrates signals from the brain with sensory signals to make sure the limbs move correctly. The team’s study represents the beginning of a new wave of research that promises to provide precise and comprehensive explanations for how the nervous system encodes and integrates sensory information to generate both conscious and unconscious movement. The research was funding by National Institutes of Health (Grants NS080586, NS086372 and NS072031), the Catharina Foundation, the Humboldt Foundation and Joan and Irwin Jacobs, through Salk’s Innovation Grants Program.